A 26 minute DVD movie presentation of over 260 still photos relating to flora from Australia and around the world. There are loads of gorgeous roses, orchids, camellias, daisies and other familiar flowers and trees from the home garden and botanic gardens. Experience the colour and beauty of nature. Accompanied by peaceful background music – no captions or narration, to enable easy viewing and listening, and reminiscence. Play the preview video. Ideal for use with high care, palliative care and Sundowner's Syndrome patients because of its calming and soothing effect of colourful images and soundtrack of beautiful piano music (similar to Tasmania's Overland Track DVD). desert flora from Utah and Arizona and flowers from Alaska, Argentina, Brazil, Chile and Florida. This movie can be useful for horticultural therapy and also colour therapy (chromotherapy). 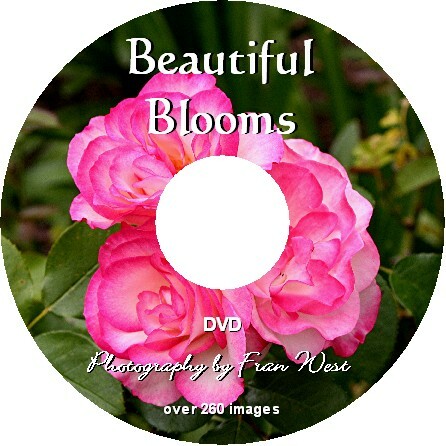 A great accompaniment to Beautiful Blooms Nonverbal Picture Book CD.